Sprite Mk IV (R4 cyl, 1275 cc, 65 bhp) - end of prod. Considerably restyled last year, the Abingdon-produced sports two-seaters continue substantially unaltered. These cars have reclining seats of PVC with attractive trim as standard, as well as sporty bolt-on wheels, although centre-lock wire wheels are available as optional extras. Although the 1275 c.c. engine is mounted longitudinally and drives non-independently-sprung rear wheels, it is substantially the same as the power-unit in the Mini 1275 GT. The sports engine however has twin carburettors and is six horsepower up on the front-drive saloon. Healey SR XR37, chassis #SR1, engine: Repco 2.995 cc. 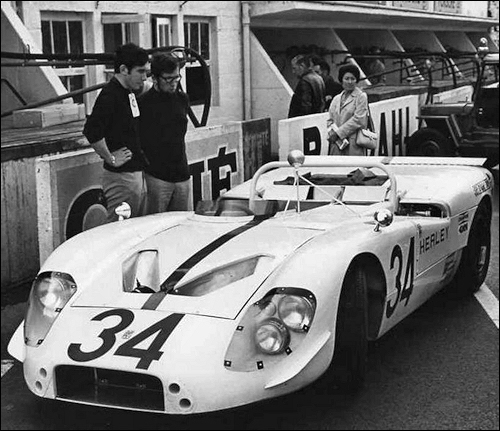 (Roger Enever / Andrew Hedges) by Donald Healey Motor Co. at 24h Le Mans.